Lady Luck intervened with the first-ever American League Division Series, a best-of-five playoff series featuring the New York Yankees vs. the Seattle Mariners. For the Yankees, it was the end of a 14-year playoff drought, while it was the first postseason appearance for the Mariners. In Game 2 on Wednesday night, October 4, southpaw Andy Pettitte7 took the hill for the Yankees and retired the Mariners one, two, three. Veteran righty Andy Benes, acquired at the trade deadline, started for the Mariners. A two-out single by O’Neill was wasted when designated hitter Rubén Sierra took a Benes offering to deep right center but Buhner was able to nab it for the third out. Seattle drew first blood with one out in the top of the third when Vince Coleman ripped Pettitte’s 3-and-2 pitch into the right-field seats. The lead held until the bottom of the fifth when five-time AL batting champ Boggs drew a two-out walk and scored on a double by Williams. The Mariners took the lead for a third time in the seventh inning, sparked by a one-out double by Joey Cora. Six-time NL steals champ Coleman hit a grounder fielded by Boggs and appeared to have been thrown out at first; however, first-base umpire Jim McKean ruled that Coleman was safe, putting runners on first and second with one out.9 Luis Sojo’s single up the middle scored Cora, knotting the score at 3-3. Griffey’s fly to medium left field scored the speedy Coleman from third, but Sojo was thrown out at second, ending the Mariners’ threat. With two outs in the bottom of the seventh, O’Neill crushed a 2-and-1 offering from lefty reliever Norm Charlton, tying the game, 4-4. Bob Wickman relieved Pettitte in the top of the eighth and pitched a scoreless inning before he yielded a single to left field by Alex Diaz to lead off the ninth. Cora’s sacrifice bunt advanced Diaz to second. Yankee closer John Wetteland relieved Wickman with one out and struck out Coleman and Sojo to strand Diaz at second. Charlton retired the Yankees in order in the bottom of the ninth, sending the game into extra innings. Neither team scored in the 10th or 11th although there was some drama in the bottom of the 11th when Yankees manager Buck Showalter sent Darryl Strawberry as a lead-off pinch-hitter for Gerald Williams. Five years earlier, Strawberry had been a superstar for the crosstown rival Mets. But by 1995, Strawberry’s career was derailed by injuries and substance abuse; he had been suspended earlier in the season for failing a drug test.10 Strawberry went down on a swinging strikeout to the new Seattle pitcher, Jeff Nelson. With two outs in the top of the 12th, Griffey lined a 3-and-1 offering from Wetteland over the 385-foot sign in right-center field to put the Mariners back on top, 5-4. After giving up a single to Edgar Martínez, Wetteland was relieved by rookie right-hander Mariano Rivera, who struck out Buhner to end the half-inning. Nelson struck out Randy Velarde to begin the bottom of the 12th. Boggs then worked a seven-pitch walk, prompting Piniella to replace Nelson with veteran righty Tim Belcher. Showalter sent rookie catcher Jorge Posada11 to run for the 37-year-old Boggs, who was nursing a sore hamstring. Belcher walked Williams, giving the Yankees runners on first and second with one out. Belcher got O’Neill to pop out to left for the second out, bringing up Sierra. With a 1-and-1 count, Sierra blasted a Belcher offering to the wall in left field, just missing a game-winning home run. Posada scored, tying the game, 5-5, but Williams was thrown out at home on a 7-6-2 relay; the tie score held. It was an epic with seven lead changes, akin to a 15-round heavyweight bout ended by a knockout. There was another significant element. This was Don Mattingly’s last game at Yankee Stadium. While Yankee fans witnessed the end of one great career, they also saw the beginning of Mariano Rivera’s. Rivera got the win this night, but had struggled as a starter during his rookie season.13 His last start had been a month earlier against the Mariners, who banged him up for five runs and seven hits in 4⅓ innings.14 Based on what Rivera had done thus far in 1995, virtually no one would have predicted the dominant relief performance they witnessed from Rivera under these playoff conditions — or the Hall of Fame career that lay ahead. I attended this game and literally felt the ballpark shake during the celebration for Mattingly’s go-ahead home run in the bottom of the sixth inning. 1995 ALDS Game 2 Yankees-Mariners condensed, youtube.com/watch?v=sBM1hbqMH_Y. 1 Bob Nightengale, “1994 Strike Most Embarrassing Moment in MLB History,” USAToday.com, August 11, 2014, accessed October 29, 2018. 2 "Major League Baseball Miscellaneous Year-by-Year Averages and Totals," Baseball-Reference.com, accessed August 10, 2018. 3 Murray Chass, "Owners Approve Realignment of Divisions." New York Times, September 10, 1993: B11. 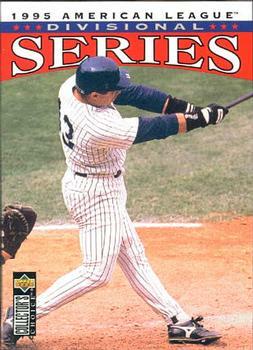 4 The Yankees acquired Martinez in a December 1995 trade. He played six seasons with them. 5 1995 Seattle Mariners Statistics, Baseball-Reference.com. 6 1995 New York Yankees Statistics, Baseball-Reference.com. 7 Pettit was in his rookie season in 1995. He had a 12-9 record in 26 starts. 8 Jack Curry, "Leyritz's Blast in 15th Makes the Wait Worthwhile," New York Times, October 5, 1995: B19. 9 Cora had not been able to advance from second with ball hit to the left side of the infield. 10 AP, “Strawberry Suspended, Released,” Boston Globe, February 7, 1995: 71. After the suspended ended, the Yankees signed Strawberry in June to a one-year $850,000 contract with incentives. AP, “Yankees Sign Strawberry,” Asheville (North Carolina) Citizen-Times, June 20, 1995: 27. 11 Posada had been a September 1995 call-up. He appeared in one game during the regular season. 12 Although the win put the Yankees up 2-0 in the five-game series, the Mariners won the next three to advance to the AL Championship Series. 13 Rivera started 10 games in 1995 and had a 5.51 ERA. Mariano Rivera player page, Baseball-Reference.com, accessed October 29, 2018. 14 Mariano Rivera 1995 Game Logs, September 7, 2018, Baseball-Reference.com.